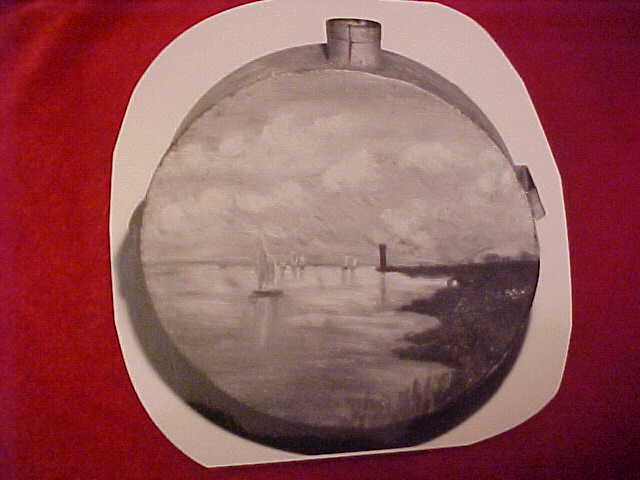 Confederate Canteen with scene of Glouster Point across from Yorktown,VA painted on canteen face. 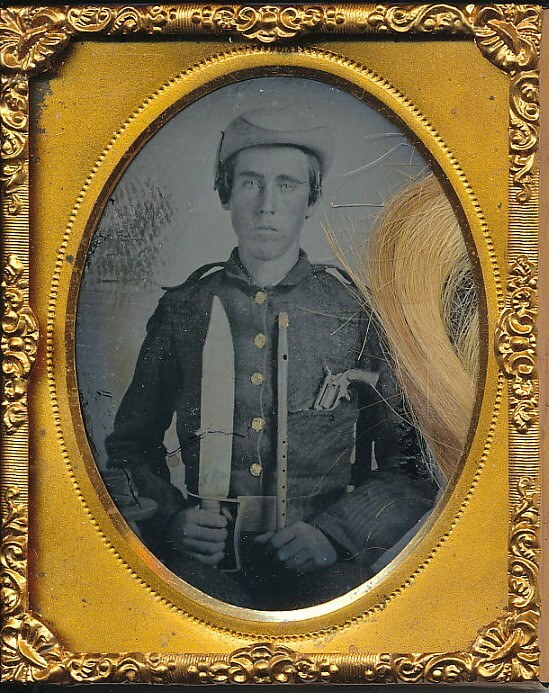 After the civil war, decorated canteens were often used as stove pipe wall covers. 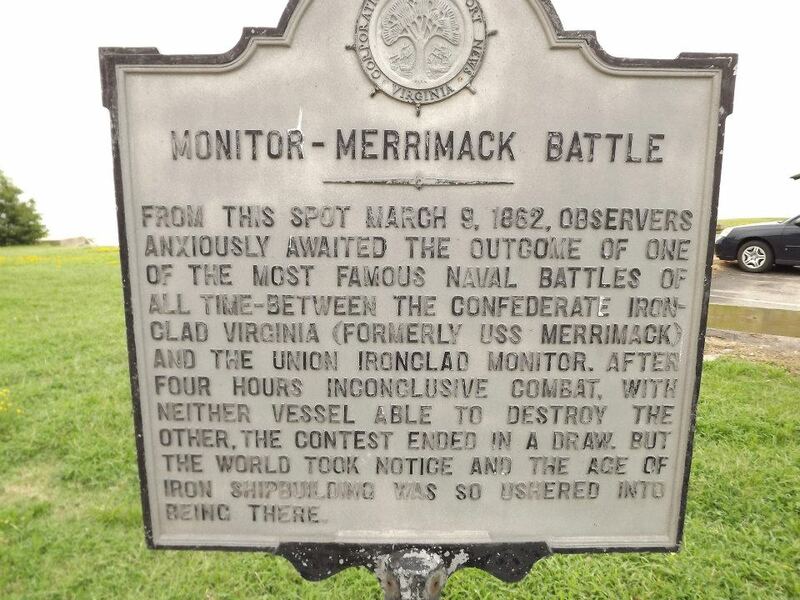 Displayed in my Cold Harbor Museum collection. Pouring the CN rubber mold at The Museum of the Confederacy. 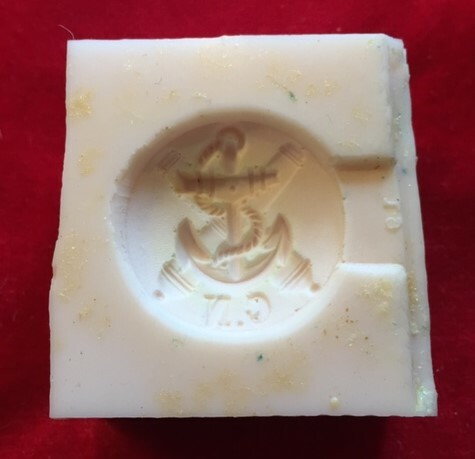 Rubber mold for the Confederate Navy seal. 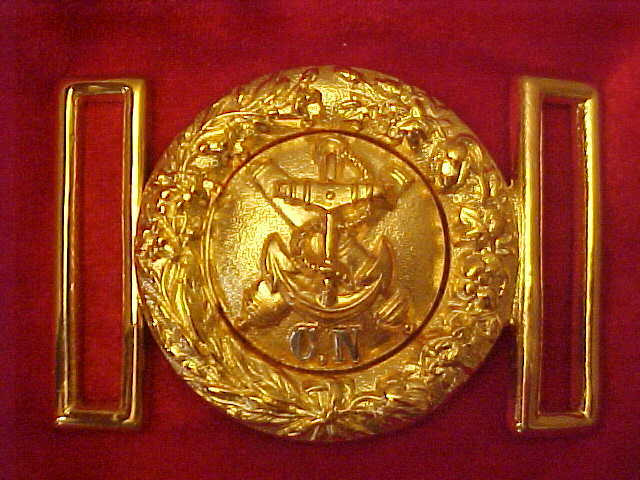 TG-CNGP.This C.N two piece belt plate was worn by Lieutenant William Pinckney Mason commander of CSS Beauford and later the CSS Virginia ll. Mason lived to age 80 and buried in Rockville Union Cemetery, Maryland. 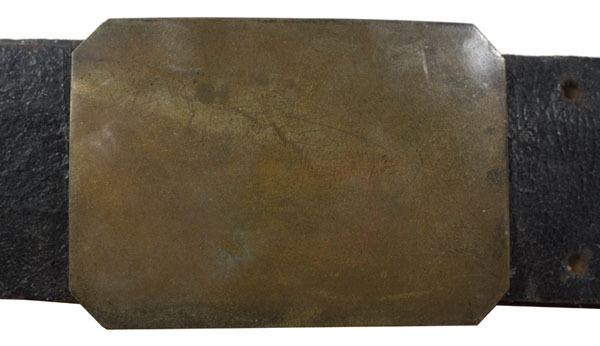 His original belt plate is displayed in the Museum of the Confederacy, Richmond,VA. This C.N. two piece is 24kt. gold plated. You can contact us about gold and silver plateing. The wreath is original but the CN tongue is a fantasy piece. I made this tongue in 1969 to add to my patterns before I copied the original CN from the Virginia Historical Society. 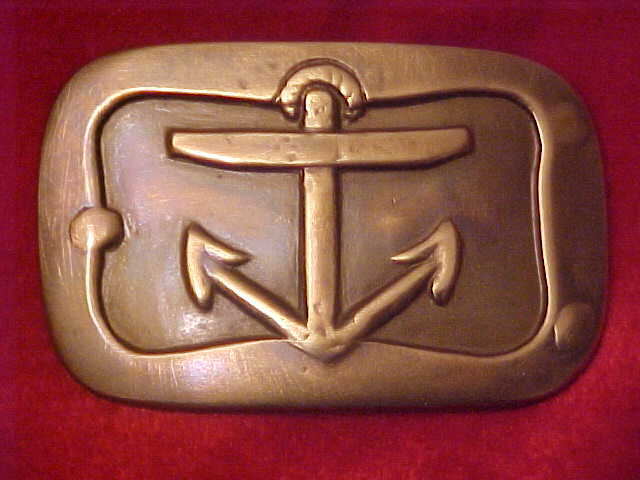 T-38 U.S. Navy Belt Plate Circa 1700's original dug Yorktown VA. 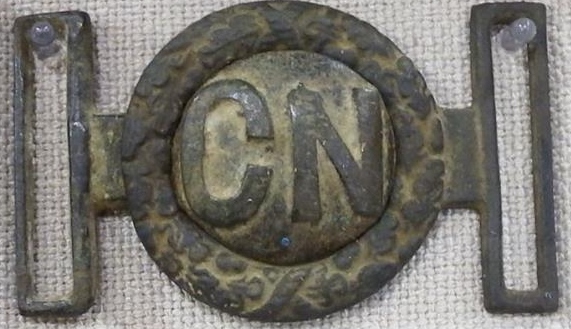 This early Navy belt plate probably would see Confederate use. Union Navy was well dressed. 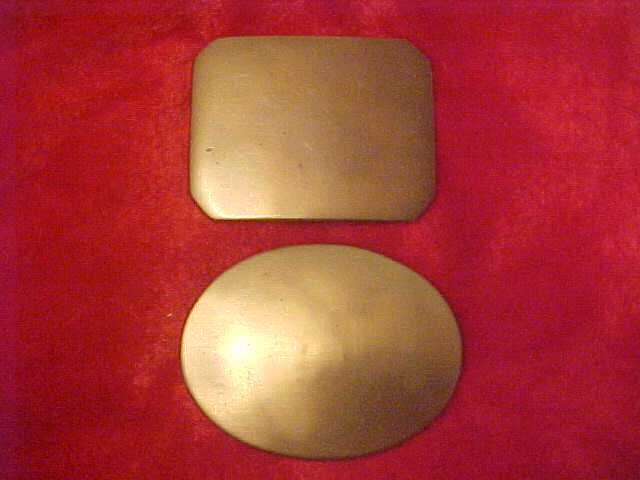 Plain Brass Belt Plate. Worn by the Confederate pictured above. 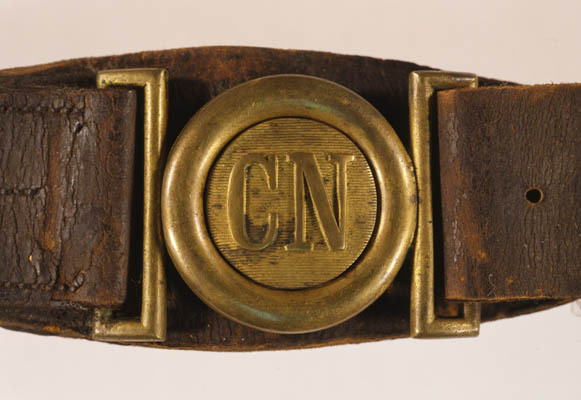 The original Confederate Navy belt plate I copied at the Museum of the Confederacy. G - 33 Militia Belt Plate & G - 34 Militia Cross Belt Plate Circa 1851 - 1865 These two plates were used by the Confederates in the Marines and early war use. 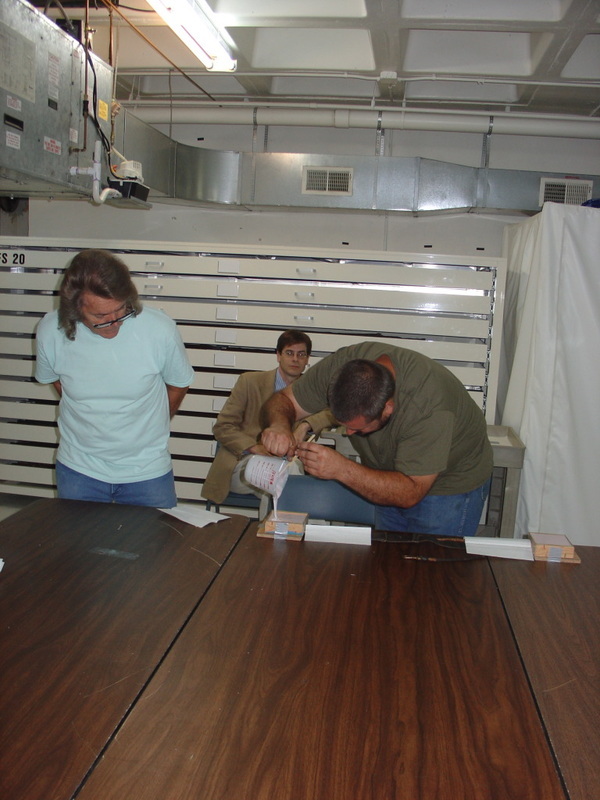 I dug many from Confederate campsites and battlefields. 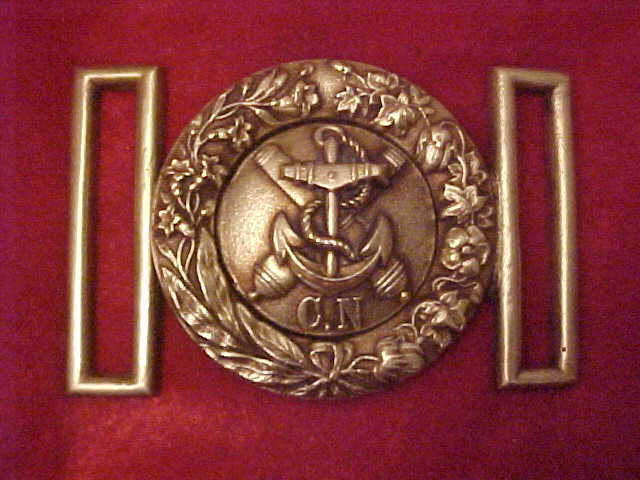 Plain brass buckle type shown in the photo on the left. 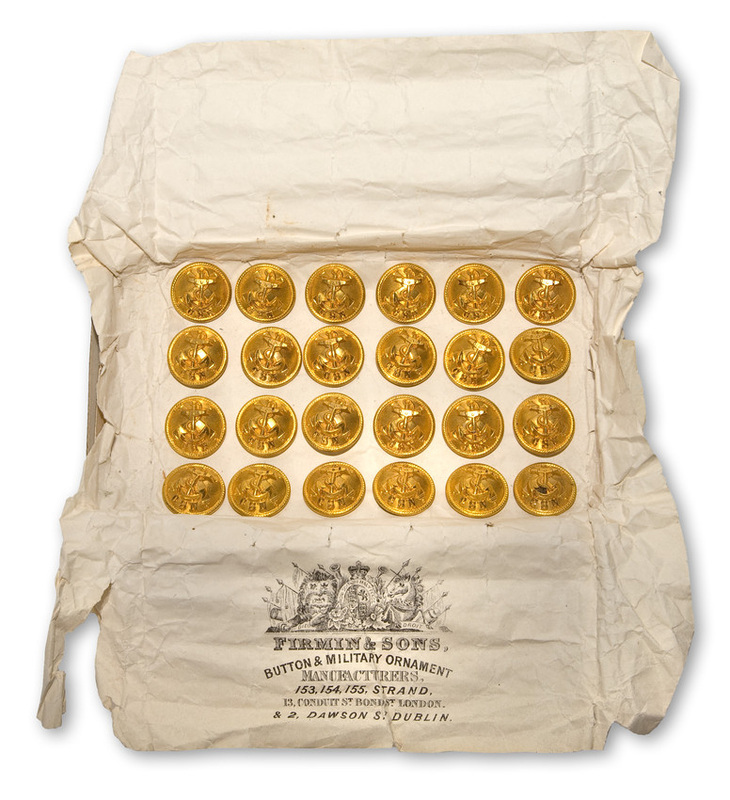 Used by the Confederate 1861-1865 and worn by Union Militia in the early years 1861-1862. The resin master pattern made from the rubber mold. 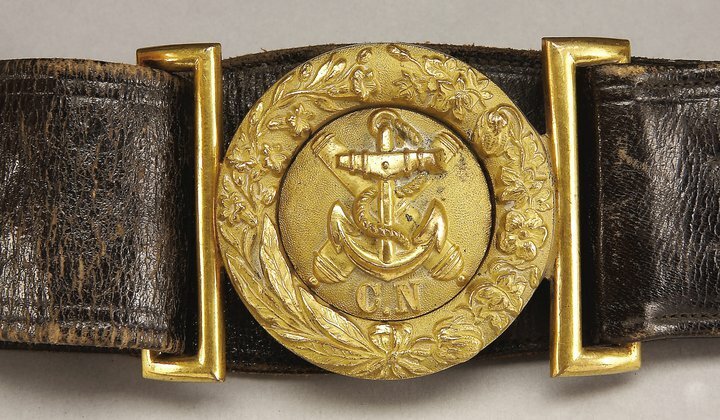 Confederate Marine Button and gold plated hat band adjustment buckle dug by Teresa Williams at Fort Darling. 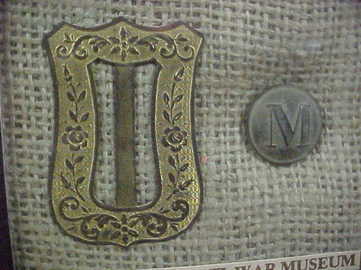 You only see the (M) button in medium size and the reason is it was used on the hat and not the uniforms. The original Confederate Navy two piece belt plate on the leather belt I copied for the master pattern. Virginia Historical Society. 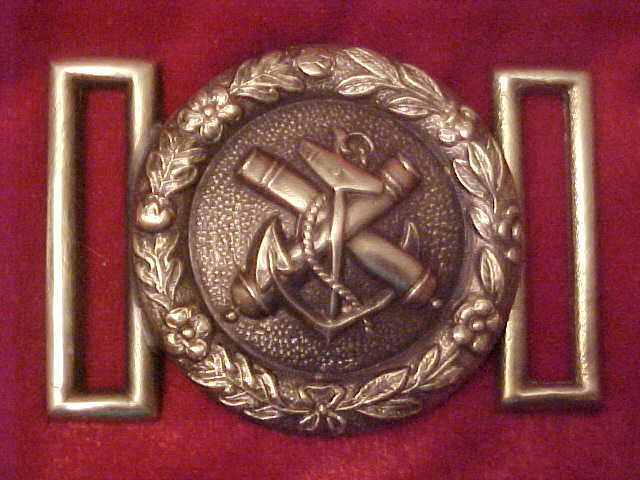 A blockade buckle. 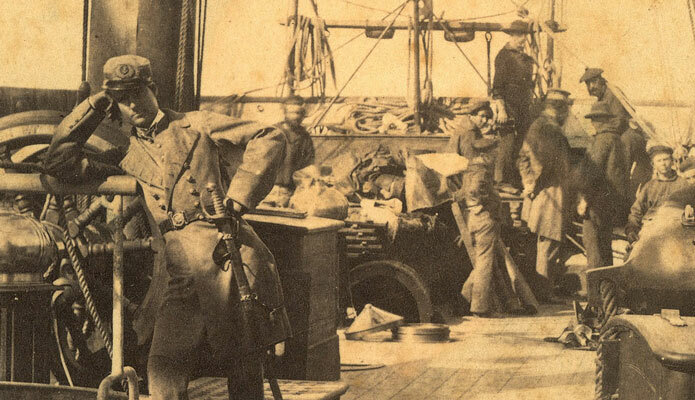 Confederate Navy Officer wearing two piece pictured on the left. 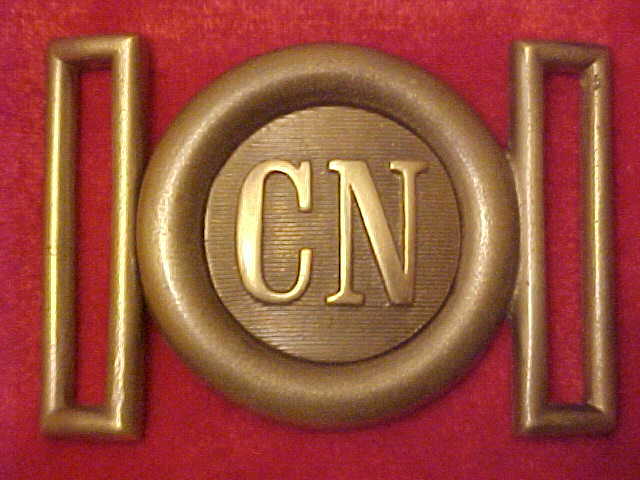 It is the same type as the first row, second CN two piece. C.S.S.Alabama. Drewry's-Bluff on one side of the James River and Fort Darling on the other. 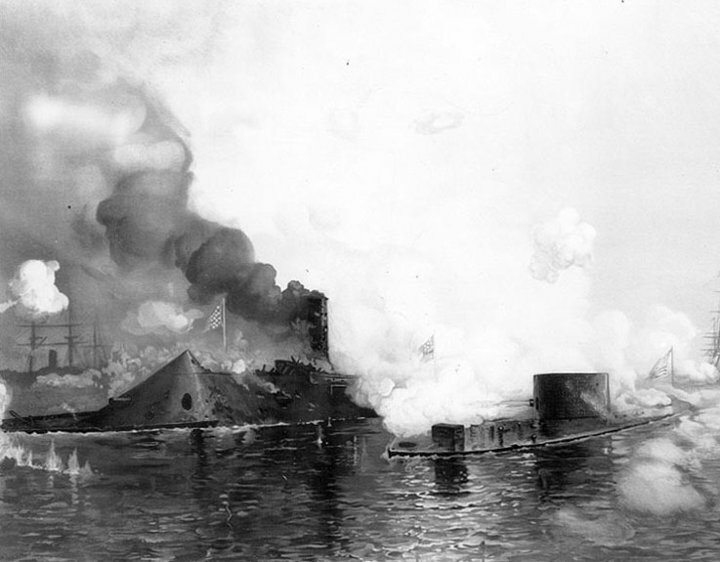 The Confederate Navy sunk ships to keep the Union Gunboats from Richmond. The original Confederate Navy two piece was not cast with a solid brass tongue like the Hanover Brass Foundry reproduction G-39. The center CN disc on the original is a thick stamped brass disc and brazed to the belt bar, not cast solid.